Fall Orange tones with a kick of pink. Bouquet has roses, spray roses, and gerbera daisies. 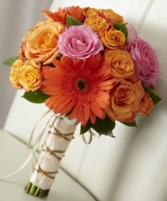 The bouquet can be made to match your special colors at any time of year. 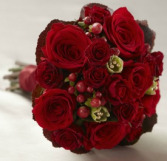 A striking red bouquet for the winter season or a Valentine wedding. Bouquet has red roses, spray roses, hypericum, and accent tulips with some gold berry accents. A gathering of gracious flowers and greens. 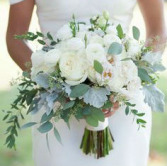 Eucalyptus, dusty miller, cabbage roses, ranunculus. Graceful Calla Lilies, simple but make a statement. 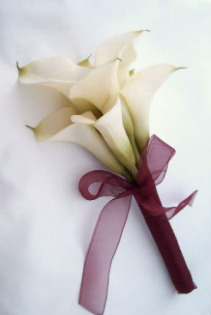 White calla lilies with ribbon of your choice. Make COFFMAN'S FLOWER STUDIO your first choice for premium fresh flowers and upscale design artistry for your dream wedding and all your special occasions! At COFFMAN'S FLOWER STUDIO, we go the extra mile to ensure your flowers are more than a memory. Our wedding consultants can offer lots of beautiful style suggestions in an effort to create the overall look you hope to achieve. Wedding flowers are something you will remember for a lifetime. These are the flowers that will always trigger special memories of the day you shared, so it's important to pick something perfectly you. Just as important is choosing the right florist and COFFMAN'S FLOWER STUDIO is ready to help you! Call us in advance at (317) 736-7667 to schedule a consultation. We'd love to help you start planning your dream wedding or your next successful event. We want to provide you with flowers that are as beautifully unforgettable as your wedding day memories will be. Call COFFMAN'S FLOWER STUDIO today!